Fr. Andrew explores the Pentecostal emphasis on faith healing and speaking in tongues as it compares to Orthodoxy. Fr. Andrew contrasts the healing of the woman with the flow of blood with the raising of the daughter of Jairus and discusses what that contrast means for us. On this Sunday of St. John of the Ladder, Fr. 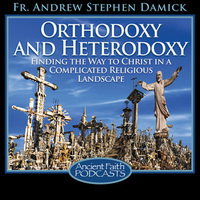 Andrew tells us that being an Orthodox Christian gives us 'something to do'.